Aggressive advocacy from AV-rated attorneys concentrating in Creditors’ Rights, Debtors’ Remedies, Business and Consumer Bankruptcy, Adversary Proceeding Litigation and Preference Defense, Business and Corporate Law, Arbitration, Mediation and Litigation of all types in the State, Federal and Bankruptcy Courts located in New York, New Jersey and beyond. "Michael is a fantastic attorney. Through the years, he has assisted many of our clients and everyone has always been more than happy with his work. I cannot recommend him highly enough." "As a busy New York commercial collections attorney, I have worked with many business and bankruptcy litigators over the years. To me, Richard stands out as one of the best. In fact, I’ve introduced Richard to some of my most important clients. Richard is a relentless negotiator and problem solver. I will continue to refer Richard to clients and colleagues, and enjoy working with him and his team." April 7, 2011- Jocelyn Nager, President, Collection Attorney, Frank, Frank Goldstein & Nager, P.C. "I have the highest regard for Michael. Michael has assisted several of my best clients. His fine work has made my clients very happy and has added value to my client relationship." November 14, 2010 - Jocelyn Nager, President, Collection Attorney, Frank, Frank Goldstein & Nager, P.C. "I have both worked with, and referred our clients to, Michael in the five plus years of knowing him. He does excellent work. Always results driven; his attention to detail is like no other. 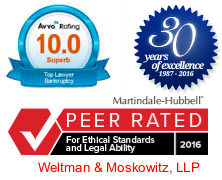 And I have heard the same feedback, always with thanks to those peers and client's who I have referred to Michael and his partner, Richard Weltman." November 12, 2010- Matthew Nemitoff, Owner, A Better Image, Inc.